I think that everybody needs to have a good and reliable full coverage concealer in their collection for those mornings where a lightweight concealer just isn’t cutting the mustard. This was a concealer that I had heard a lot about because of YouTube and different blogs and I was so excited to try it out for myself. In a haul I decided to treat myself to pretty much every single MAC concealer that they sell and even though I liked majority of them, it is this MAC Pro Longwear Concealer that really made me stop in my tracks and acknowledge just how good my skin was looking. There are quite a few occasions that I need a heavy-duty concealer for. First one being that I am a student and most days of the week for me involve drinking with my friends. And, if I am not drinking with my friends I am cramming in revision or more often than not, binge watching box sets in bed. 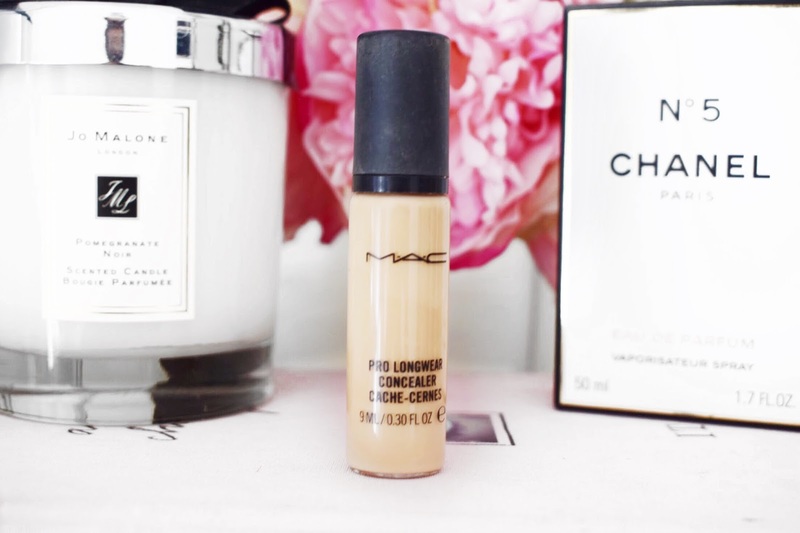 It is that reason why I have fallen in love with this MAC Pro Longwear Concealer, because I need something that is full coverage and that will hide my enormous eye bags the following day and that is what this product is to me! The first thing that I want to talk about in this review is the packaging. Packaging is something that is very important and that is why I want to talk about it first, because it is what you see first. I love how sleek this product looks with the glass tube. I adore that it has a pump because it is great to have as part of a makeup kit, but I also don’t mind it for an everyday basis. As well as this I like it because it is clear to see how much product you have left in the tube. One thing that I will say is that the glass tube isn’t great for travelling with as these are prone to smashing, so take extra care with them. Next up, I want to talk about the coverage, because that is so important when it comes to a concealer. This is a full coverage concealer, which is right up my alley. I need full coverage not just to hide the darkness underneath my eyes, but also to help disguise my hyperpigmentation that I have on my cheeks. With just a small amount of this, everything is covered easily, without having to build up the coverage. If a concealer has coverage any less than full it really isn’t for me, so this is just perfection. I have found that a very small amount of this stuff goes a very long way especially when concealing underneath the eyes. I also really enjoy the consistency of this MAC Pro Longwear Concealer. When you pump this out either on the back of your hand or onto a palette, it is easy to see that it is quite a watery product. It is much thinner than other liquid concealers that I have tried, which is great to say that you still get a really high level of coverage. Because of the thin and creamy consistency, I have found that this concealer doesn’t crease or settle into any of the fine lines around my eyes, nose or even in my smile lines. And, when I blend it in using my damp Beauty Blender, it looks lovely on the skin because it gives a full coverage but natural kind of look. There isn’t much more that I can really say about this MAC Pro Longwear concealer other than the fact that I really love it. If I was still working freelance I know that I would put this in as part of my professional makeup kit. The coverage is lovely, consistency ideal and it blends into the skin like an absolute dream. I know that I am going to be using this for a very long time because of how beautiful it looks on the skin. I will leave a link to this product down below in case you want to check it out for yourself. Make sure to leave me a comment if you have tried this out for yourself and tell me what you thought about it!